Doors open at 7:30 am with breakfast being served. Program begins at 8:00 am - 10:00 am. 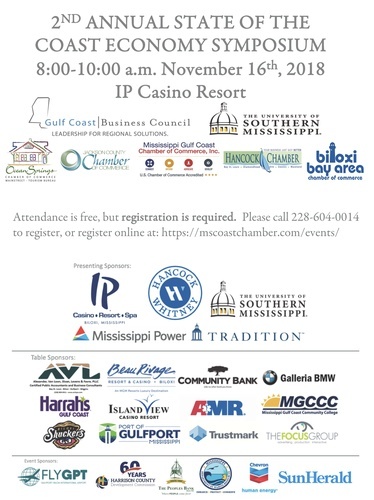 You are cordially invited to attend The 2018 State of the Coast Economy - a special joint symposium of the Gulf Coast Business Council, the Mississippi Gulf Coast Chamber, the Jackson County Chamber, the Hancock County Chamber, the Ocean Springs Chamber and the Biloxi Bay Chamber of Commerce. During the session, detailed regional data regarding the current state of the Coast's economy will be presented.